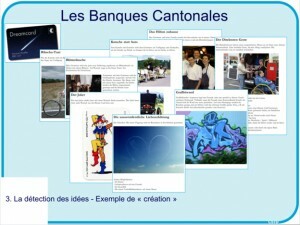 The image is from our presentation in French you can watch here: “What we do”. Association of Swiss Cantonal Banks (homepage) celebrated its 100 anniversary in 2007 and offered “dreams” to the Swiss population. We were contacted to go beyond the propositions made by the main agency. The association asked us to think in a deeper way about “dream” and to create more innovative ideas that could be added to the set of rather conventional dream-gifts. An idea detective usually detects existing ideas. But, as you can see in this example, we have the knowledge and the experience for creating ideas, too. This know-how allows us to be a better idea detective, to ask the right questions to the people, to search in the right places in order to detect the hidden, refused and unconsidered ideas. One of our ideas was actually carried out by the Hotel Hilton Basel (homepage). It was a completely new service concept: “hotel@home”.